Arriving a few weeks after Britney, “Blame It On The Weatherman” could be a sad afterthought, forgotten jetsam from a swept-away moment like Frank Ifield’s “I’m Confessin’”, his last number one released into the teeth of Beatlemania. Instead it’s a delightful last hurrah for the tweenpop British and Irish bubblegum of ’98: not the most exciting or best-selling record of the time, but one of the sweetest. “Weatherman” starts off sounding like a decent imitation of Natalie Imbruglia’s “Torn” – searching, slightly introspective acoustic pop, already an interesting step away from the grinful sound of B*Witched’s first two singles. It has what turns out to be a false chorus – “Won’t blame it on myself…” – then a rather lovely passage rising up to the actual chorus, which is when things get more dramatic. The clouds burst – kettledrum claps, a downpour of pizzicato and an open-armed Edele Lynch welcoming the cinematic deluge. “The rain goes on!” – it’s a thrilling hook, throwing open the doors on a forgotten world of big-production light-entertanment pop. It’s the moment B*Witched lean into the Nolans comparisons. “Weatherman” could – in spirit if not quite in style – be from the 60s or mid-70s, or whenever you’d want to place a half-remembered childhood hit: for all the tempest, there’s something heartening about this record, cosy and familiar. An impression cemented by the break in the clouds on the “Maybe it won’t change….” middle-eight, with backing vocals that sound like contented mews. “Weatherman”, a widescreen song humbly released as a fourth single in an album cycle, puts the enormous promotional machine behind a Britney into sharp contrast. Bubblegum has no long term game plan, no artist development – the likes of B*Witched try a thing or two, have hits until they don’t. and that’s that. That’s why seasons of bubblegum – like 1998 or 1969-70 – rarely produce lasting stars, but often produce records as charming as this. Coming up next: Lists of superior-to-this songs which also have the word “the” in their title. After giving 6s, I’m sufficiently charmed to stretch to a 7 here. Easily the best B*Witched song, though even their worst was better than anything that Stipe and pals ever gave to the world. #31: I used to have an incredibly boring spreadsheet for “songs I own with X characteristic in the title”. Numbers, days of the week, food, colours, animals, etc. Ran out of steam updating it about five years ago – I could probably recreate it with flags in Catraxx, if I was really that bothered. #34,35: My only list of that kind is an iTunes playlist with all songs including a “?”. Sometimes when I get very bored, I browse through its 200+ songs and imagine it being turned into a TV quiz show (“Fingers on buzzers: Is she really going out with him? Can you forgive her? What else is there? Who’s that girl? Do you really want to hurt me? Are “friends” electric?” – and of course the 1.000.000-quid question: “Would?”). That sounds like my similar game, where I compile a list of band names with “and” in, and switch it with ‘or’ to make a multiplechoice question. @37 You are Erwin Schrödinger and I claim my five energy eigenvalues. #30 – “Tinseltown in the Rain” has to be the ultimate Glasgow in the rain song, surely? Possibly the ultimate Glasgow song, actually. @Leveret, 39. How could I/we have forgotten that one! Excellent. @JustifiedAncient, 31. Point taken, but, honestly, when you write songs for a while (and not just near reflexively when,say, 16) then there really is a feeling whenever you broach a standard topic (‘love’) or strand of imagery (‘rain’, ‘moon/stars’, you name it) of getting in the ring with all of your mighty predecessors (and you start to notice important abstainers – Stephin Merritt hasn’t done any ‘Rain’ songs that I’m aware of). It’s hard to find to something new to say about what rain is like, etc.. ‘The’, however, triggers no such anxieties. Note that there’s a similar anxiety of influence about standard scenes, and ‘rain’ scenes in particular in film, and when someone does something new or interesting with a scene of the relevant kind it really pops precisely because it’s instantly in the ring with some greats. Hobart Paving by Saint Etienne is my favourite rainy-breakup song. It’s a bit hard to make out, but I think it could be a cover. Back home from London now, I can report that the BIOTW video I had no problem viewing on my phone last week is now inaccessible. That’s 3 straight B*Witched videos that are apparently blocked in America. Weird. General observation on this trip was that Britain felt a lot less “foreign” to me than it did 16 years ago. Of course, shared language/culture meant it always felt more familiar to me than anywhere outside the US except Canada, but still, a lot of my 1989 and 1998 observations are no longer accurate. I guess that’s globalization for you…. Music-related, I did get some exposure to 2014 bunnies that I hadn’t previously due to the hotel lobby TV that was tuned to music videos 90% of the time. (in the US, lobby TV’s are usually tuned to Fox News :( ) Of course, this exposure was far less notable than it would’ve been years ago, as I can easily check out the videos on Youtube anyway…as long as they’re not B*Ocked. 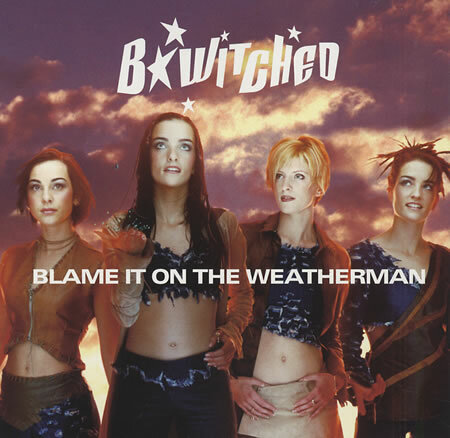 Of course, the Bob song was the inspiration for naming of the Weatherman Underground, the US home-grown radical leftist movement of the early 1970s….I suspect the B*witched lasses knew nothing of this (nor cared). The denim look, from the sleeve artwork seemed to have disappeared – did it ever come back? Though the video is important again (maybe waterworld was some sort of influence) this is the one b*witched effort that you can enjoy without it. A charming underrated performance and the last decent thing they did. 8 is a bit of a stretch for me but it merits a 7.